In a recent survey to discover what checks, if any, conveyancers do before sending money to the seller's solicitors, it was revealed that 80% of conveyancers are still not performing bank account checks before handing over client and lender monies. The survey was conducted at a recent conveyancing CPD seminar designed to help property solicitors mitigate risk and comply with regulatory requirements and was hosted by TM Group featuring guest speaker Jenny Owen from Lawyer Checker. Mortgage fraud is one of the most significant and costly areas of risk for conveyancers and can put your PII renewals under serious threat. In 2013, the National Fraud Authority estimated the annual financial loss attributed to mortgage fraud at £1bn and lenders and clients will almost certainly have the inclination and right to initiate litigation to claim any lost money back. Not only is mortgage fraud costly but it’s becoming more frequent and even harder to detect. 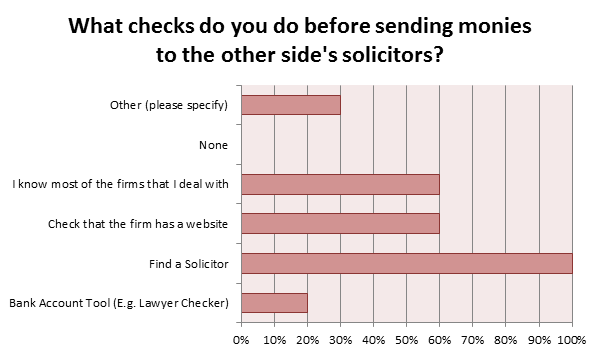 Interestingly, every single respondent to the survey stated that they rely on the ‘Find a Solicitor’ search on the Law Society’s website, but in 2013, the SRA reported a 57% increase year-on-year of the number of reported bogus firms listed within this search. If you are using this website as your only source of reference, there is a significant risk that you could be sending your client’s money to a bogus law firm. Bad for your bank balance, PII renewals and your credibility with the public. Almost two-thirds of those that answered the survey considered the fact that they ‘know most of the firms that they deal with’ to be a satisfactory check to combat fraud but local knowledge isn’t enough. A modern trend emerging is for the fraudsters to invent fake branches for a real law firm – even going so far as to clone their website - in order to trick you into transferring your client's funds to the fraudulent law firm. This creates the real risk that the 60% of respondents who simply ‘check that the firm has a website’ are opening themselves up to serious risk. Only 20% of respondents claimed to use a tool that checks the history and security of a solicitor's bank account as one of the measures they currently use to protect themselves from fraud. Lawyer Checker provides a fully integrated solution designed to provide enhanced due diligence for conveyancers and is available through the TM website. The Account and Entity Screen is just £10+VAT per case and looks for a track record of use on the bank account number provided identifying whether or not it has been subject to multiple and large movements of funds. The search is conducted over 10 databases to equip you with as much information as possible to help you make an informed decision as to whether you feel that the account is legitimate or not. Contact our sales team today on 0844 249 9200 to discuss how TM Group can help you mitigate risk and work more efficiently in property transactions.